Soil mesofauna are often categorized by specific feeding behaviors, often depicted as microbial feeders. 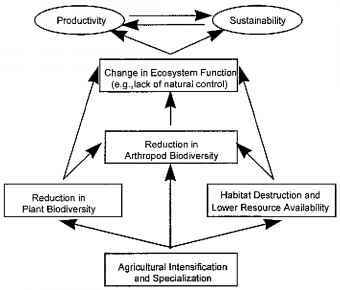 However, it should be emphasized that many organisms are at least capable of feeding at other trophic groups. As a result, omnivory in soil communities may be more prevalent than assumed previously (Walter et al., 1986; Walter, 1987; Walter et al., 1988; Walter and Ikonen, 1989; Mueller et al., 1990). Our discussion will focus specifically on nematodes, Collembola (springtails), and mites because they predominate in total numbers, biomass, and species of fauna in soil (Harding and Studdart, 1974; Samways, 1992). Soil nematodes are relatively abundant (6 x 104 to 9 x 106 per m2), small (300 |im to 4 mm) animals with short generation times (days to a few weeks) that allow them to respond to changes in food supply (Wasilewska, 1979; Bongers, 1990). Relative to other soil microfauna, trophic or functional groups of nematodes can be identified easily, primarily by morphological structures associated with various modes of feeding (Yeates and Coleman, 1982; Freckman, 1988; Bongers, 1990). Nematodes may feed on plant roots, bacteria, fungi, algae, and/or other nematodes (Wasilewska, 1979). Mites and collembolans can account for 95% of total soil microarthropod numbers (Harding and Studdart, 1974). Soil mites occur mainly in three suborders. The suborder Oribatida (Cryptostigmata) comprises the numerically dominant group in the organic horizons of the soil. Members of the mite suborder Mesostigmata (Gamasida) are relatively large, active mites. The mite suborder Prostigmata (Actine-dida) is a large and taxonomically complex group. Soil prostigmatids have more heterogeneous feeding habits than other mite suborders (see table in Kethley, 1990, for feeding habits). Prostigmatids are mostly fungal feeders and predators. Collembolans are abundant and distributed widely. Collembolans have relatively high metabolic, feeding, and reproductive potential. Functional classification of collembolans (Christiansen, 1964; Bodvarsson, 1970; Verhoef and Brussard, 1990) can be based on gut content or shape of the mouthparts, which are adapted to the specific feeding habit (Swift et al., 1979). Because most forms of Collembola feed on decaying vegetation and associated microflora, the distribution of mycelia and spores of saprophytic fungi may be a major factor influencing the distribution of collembolans. Other groups of arthropods that occur commonly in soil are pseudoscorpions, symphylans, pauropods, proturans, diplurans, and the immature stages of holome-tabolous insects (Dindal, 1990). Ants and termites can also be very numerous; however, these macroarthropods will not be considered here (Brian, 1978).